It’s good to back in New York. My New York, the unsung Uptown, where I’m enveloped by the golden vowels of Antillean Spanish and the throb of bachata and reggaetón from passing cars. The ribbon of park along Riverside where strangers smile and greet each other every morning. Bodegas where air fresheners are so strong they almost knock you out. Sidewalks where vendors sell sculpted pineapples and crushed oranges from shopping carts, rats scurry among abandoned mattresses, and a gaggle of men with millimeter-thin sideburns have consacrated a few square feet of pavement as Zona D Yankees. The city where I won’t ever feel alone, because I’m gently rocked to sleep by jackhammers, car alarms, wailing sirens, reversing trucks, the thunder of the elevated subway track. The city I love. No time for cooking right now. Instead, I’ll soothe my jet lag with a tub of green tea ice cream. In Finland I couldn’t get the storebought stuff, so I reclaimed my ice cream maker and made a batch from scratch. Just like New York, people either love it or hate maccha ice cream. 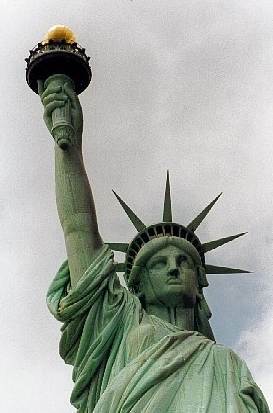 And it’s the color of Lady Liberty, more or less. Lightly whisk egg yolks in a pan that has a thick bottom. Add milk and sugar to the pan and mix well. Heat over low heat, stirring constantly, until the mixture thickens (and coats the back of a wooden spoon – about 7 to 8 minutes). Remove immediately from the heat and soak the bottom of the pan in ice water to prevent splitting and curdling. Cool the mixture. Mix hot water and green tea powder together. Add the green tea to the egg mixture and mix well, cooling in ice water. At this stage, it’s a good idea to refrigerate the mixture for a few hours or overnight, particularly if the ice cream maker uses a bowl or plate that is frozen separately. Add whipped cream to the green tea ice cream mixture and mix well. Freeze the mixture in an ice cream maker. This recipe makes less than one liter of ice cream, so if you are serious about it, double all ingredients. You and your brother are both such lovely writers! And you must be uniques in blog world because you’re probably the only sister/brother team with a food blog. I have yet to see New York and your post only adds to my desire to visit. As for the ice cream, the moment that there is even the slightest indication of warmer weather and I already begin dreaming of ice cream and gelato. I have clipped and saved your recipe! May I ask what ice cream maker you use? I’m in the market for one and am looking for referrals. My ice cream maker is one of the very few things I’ve ever won – I got it as a prize from a recipe contest more than five years ago. It’s a Philips Delizia Duo, with a detachable flat freezing element and a fairly quiet electric motor. The pros: it’s easy to assemble, use, and clean; the freezing element does not take too much freezer space either, and freezing a quart takes about 25 to 45 minutes depending on your starting temperature. The cons: you have to freeze the element for 12-24 hours prior to use, and since you rely on the freezing power of the cold-absorbing gel, the ice cream maker works best if you pre-cool whatever you are going to freeze. Also, it only makes maybe 1-1.5 quarts of ice cream at one go, and is not powerful enough for several successive batches. In summary, this model works well for home use. But if you wish to make large quantities fast or will use your gelatiera nearly every day, go for a more industrial model (unfortunately, they tend to be really expensive). In any case, I’d definitely check ebay first for all those unwanted wedding presents! Let’s hope you get a chance to travel to NYC soon – let me know when you are coming and I will introduce you to Dominican snocone vendors who will flavor shaved ice with jewel-bright homemade fruit syrups! Hi Anna – I have a) never been to New York (or anywhere in the US) and b) never had matcha in any shape or form. However, a Japanese friend of mine is due back in Edinburgh soon, and she’s promised to bring me some matcha powder, so I can give your ice cream a go! BTW, in Helsinki, Tokyokan on Annankatu carries tiny 30g jars of maccha. You’re not going to believe this but the reason I need an ice cream maker is that our old model just gave up on us and it was a Philips! I’m looking for something a bit bigger, I’ll let you know what I end up buying. And thank you for the invitation … when I get to NYC, I will most certainly give you a call! Delightful notion about the color of the ice cream! 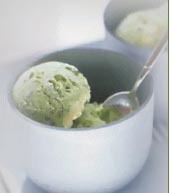 The only time I tasted green tea ice cream was in Japanese restaurant in California something like 5 years ago. Now that you remind me of it, I remember really liking it. I wonder if the Japanese restaurants in Helsinki have it? It’s a small world for green tea ice cream lovers! Chili&Vanilla writes about having tasted green tea ice cream in NY and I’m wondering whether it’s a sorbet-type thing or more like a real gelato and here you give me the answer in no less than ten minutes. Now the world has to shrink a little bit more for me to be able to obtain matcha powder in Budapest. Perhaps it will… Whether it is a good thing or not, well, that’s a more philosophical queszion. Kiitos reseptist?, Anna!